On Friday, March 20, 21st Century Fox announced a $50,000 grant for Give a Note Foundation in celebration of the final episode of the television show, Glee. This gift was a follow-on grant to a 2011 campaign – Glee Give a Note – that provided $1,000,000 in grants to 73 schools in 24 states. At the time, Glee worked closely with Give a Note Foundation and the National Association for Music Education to develop a strategy for these grants. What we learned from this program has been the driving force in the philosophy of the Give a Note Foundation – Music learning and music study involve much more than donating instruments. In the 2011 campaign, school principals were invited to submit a video creatively telling why their school needed funds for their music programs. Once the videos were received and processed, schools were asked to engage their communities in voting for their school to get to the next round of selection. Four hundred schools vied for 73 grants of $10,000, $25,000, and $50,000. Local media covered the stories and ‘campaigned’ for viewers and readers to vote for their local school. In a three week period, more than 1,000,000 votes were cast. A committee made the final decision on which schools would receive grants. The grants were distributed as cash payments – not instruments, not product – cash. The distribution of cash grants was a strategic decision. The seventy-three schools selected were very diverse: Some were in urban areas, others in rural communities; some had full-time teachers, others had teachers who taught at 3 or 4 or 5 schools; some were elementary schools, some were middle or high schools. 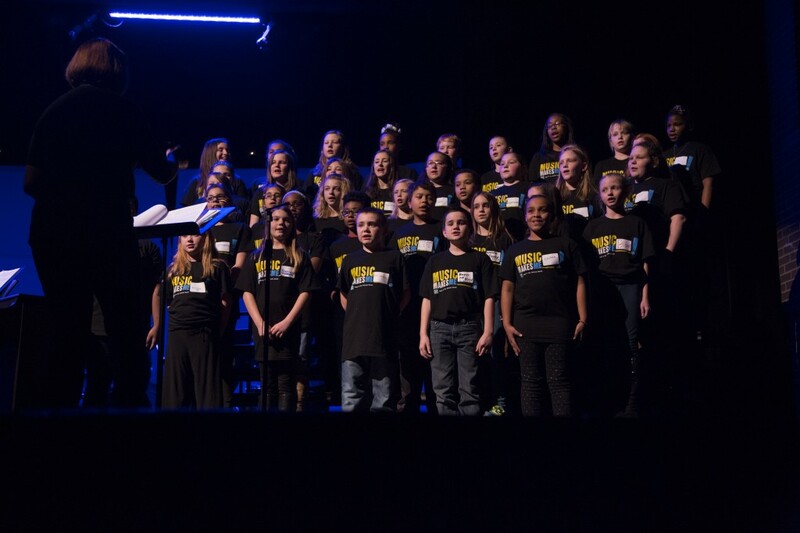 We knew each school would have different needs…because while Give a Note Foundation is fairly young, the National Association for Music Education (NAfME) has been supporting music study for more than 100 years. Over the course of that 100 years, NAfME has come to have an understanding of what schools, communities, teachers and students need to help students be successful. Working with NAfME, who has a direct connection to schools through teachers and administrators, is an important factor in getting resources to the right places. What has Give a Note learned in the last five years of grant making and program support? • Music is a key component of student success. Schools with strong school-based music have higher graduation rates, higher attendance rates, higher test scores, and greater parent engagement than schools without music. • Music learning as part of the school day with a trained music teacher is more valuable than music programs that are ‘exposure’ programs or limited to one-type of music learning. • Kids need more than instruments to learn music. Music learning is comprehensive and sequential – and although these are not exciting terms, it is true that students learn in a way that knowledge and principles build upon one another. This is true for almost every other discipline. Music learning must have context. • Music is collaborative. The beauty of music is that students make music together. Students learn, practice, and perform together. It creates unity and teaches interdependence. Support for school music is multi-faceted. There must be buy-in from administrators, decision makers, parents, and community members to start, grow, and build music. • Supplemental support from performing arts organizations and individual artists can enrich the student experience, but it should not be a replacement for school music. • The value of direct dollars to grow and expand music in the form of grants is exponentially increased with a corresponding awareness campaign. Every day, more and more people/organizations are jumping on the bandwagon to get music to kids in need. There is now, more than ever, widespread agreement that music can positively influence a child’s life. There is not widespread agreement on how to make sure that all students have music. There is also not widespread agreement on what that ‘music’ should be. Organizations have been formed to give kids a “rock band” experience, or to provide an instrument, or to fund a music demonstration, or to provide lessons to underserved youth via internet. Give a Note remains one of the only charitable organizations that supports a comprehensive approach to music learning in a place that nearly every student passes through daily – his or her school. • Give a Note strategically provides grants that allow teachers and administrators to work together to leverage the grants against other resources. • Give a Note grants are distributed as part of an overall awareness campaign that highlights the positive influence and accomplishments of school music. • Give a Note empowers the community to engage with and support music by developing relationships with business leaders and decision makers. Give a Note Foundation has one focus – getting more students involved with music by increasing access and expanding support. Thanks to donors and supporters like 21st Century Fox, 20th Century Fox Home Entertainment, Glee, Disney Youth Programs, Radio Disney, and Big Machine Label Group we are able to help communities in a way that will deliver the greatest impact. Because kids need more than instruments to make music.